A 34-year-old man with right-sided cluster headache presented with a stroke from right-sided moyamoya. Following surgery on the right, both moyamoya and cluster headache remitted, but eighteen months later a cluster attack and symptoms of cerebral ischemia from moyamoya recurred on the left. Again, following surgery on the left, both moyamoya symptoms and cluster attacks disappeared. 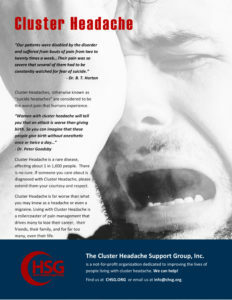 Cluster headache secondary to moyamoya has not previously been described.